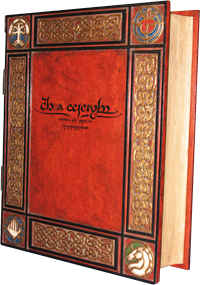 … you get the War of the Ring Collector’s Edition. Yes, I’m now the proud owner of the Holy Grail of board games: number 600 in the 2,000 worldwide print run of the Collector’s Edition of my favourite game of all time. And what a monstrous beast it is! A big, heavy wooden box measuring 480 x 550 x 130mm. I’m still trying to work out where I’m actually going to put the thing. I put off buying this edition when it was first released, thinking it was really too much, and that one day I would get around to painting all the miniatures myself one day, but after playing the game again the other night I realised just how wonderful a game it is; and how much better it would be with a larger map, larger cards, and fully painted armies. So the next day I started hunting for a copy, not really believing that I could get one for anywhere near a realistic price. Luckily, I found a fellow gamer who was willing to part with his set. The quality of the paint jobs on the 200+ miniatures is much better than I expected, and the perfect bound, hardcover, high quality rulebook is a beautiful thing. Sure, it’s a crazy, self-indulgent purchase. But the time is long past for me to pretend that I’m not a boardgamer through and through, and in a way this is the ultimate expression of my enjoyment of that hobby—not to mention my lifelong love of The Lord of the Rings. Update: New War of the Ring rules summary and reference sheets on the Game Sheets page. Many people of my generation are no doubt mourning the passing of an icon from their teenage years, Gary Gygax, co-creator of Dungeons & Dragons, who died this morning, aged 69. Gygax didn’t create the famous role-playing game on his own–Dave Arneson helped develop the original miniatures wargaming rules Chainmail into the role-playing game we’d recognise today, back in 1974—but his contributions and dedication to the game qualify him as the most popularly recognised ‘father of D&D’. This could be a curse as well as a blessing, since he copped a lot of flack back in the 80s when psycho Christian groups decided that D&D was responsible for everything from teen suicide and murder to witchcraft. As a teenager I even wrote a long and passionate letter defending the game to the Sixty Minutes programme after they ran a ridiculously misinformed and sensationalised segment about D&D. 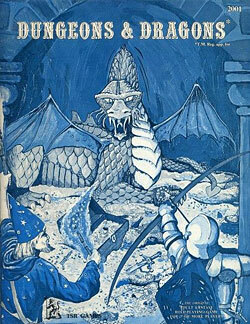 As I said then, and I still believe now, playing D&D was a fantastic and enriching experience for any teenager. I’m convinced that being the ‘Game Master’—creating maps, designing character sheets, planning games–put me on the road to be a graphic designer. I shared a lot of great times with friends with whom I’m still close today, and we can still laugh about classic moments that happened during our old games. We adventured in haunted dungeons, foiled smuggler’s plots, fought hordes of ratmen, wandered across post-apocalyptic wastelands, exchanged laser fire on distant worlds, fled from victorian-era ghosts and followed the trail of Lovecraftian cultists. Sure, it was a little tricky juggling the geekiness of role-playing games with being relatively cool, going to parties and getting girlfriends, but I drummed in a band, so that helped. Though we used to dream about computer versions of our favourite game, I feel like kids now are missing out on all of the wonders their imaginations can conjure. Swordplay with beasties in lifelike computer-generated worlds is all very well, but it can’t beat the totally immersive experience of a good roleplaying game session, which can go way beyond combat to the most complex and involved plots and personalities. As a matter of fact, we’re planning a game (using the Warhammer Fantasy Roleplaying 2nd Edition system) in a few weeks, for the first time in many years. We may have all entered our forties, but we still have healthy imaginations, and it’s not too difficult for the players to take on their old characters–Lucidius Lavarar, the dissolute and outrageously dressed charlatan and raconteur; Robert Lacy d’Aghuilam duCourt, the arrogant Elven noble and professional duellist; Fatuus Fitzue, the tatty journeyman wizard. Hilarious situations will ensue, vicious combat against horrific foes will be joined, mysteries will be unravelled, and no doubt the world will be saved from the clutches of chaos (again). We’ll be sure to toast Gary Gygax when we start playing. Boing Boing interview and video. Guillermo del Toro has come into his own with his new Spanish-language film Pan’s Labyrinth, a stunning journey through two parallel worlds of cruel reality and uncompromising fantasy. I was lucky enough to see this film over a month ago when we won free tickets to a sneak preview, and now that the film is in the cinemas it’s a pleasure to see it receive such wide acclaim. del Toro has definitely realised the potential he showed in relatively mainstream fantasy actioneers such as Blade II and Hellboy. Pan’s Labyrinth tells the story of Ofelia (Ivana Baquero), a young girl forced to live with her ailing mother and cruel stepfather in the countryside of Spain in 1944. Her sadistic Fascist stepfather Capitán Vidal (a frightening Sergi López) is determined to rid the area of Republican sympathizers who are hiding out in the woods. The harsh reality of this story is interwoven with Ofelia performing several dangerous tasks given to her by a faun (Doug Jones) she encounters in a labyrinth near the house, who tells her she is the rightful princess of the underworld. To his credit, del Toro doesn’t let either of the threads of his story—the real or the fantastic—dominate, but skillfully weaves them together, allowing each to reinforce the other. The fantastic world can be cruel and horrifying—the incredible Doug Jones is a very scary child-eating, tottering creature called the Pale Man whose skin hangs in loose folds and sees through eyeballs in his palms like stigmata—but the real world can be equally so—Vidal tortures and kills members of the resistance without emotion. While sometimes difficult to watch, the reality of both worlds is reinforced by the unflinching violence. This is not a film for kids, parents, even if it is about fairy tales! Ivana Baquero plays the young Ofelia with an ‘unprocessed’ innocence and intensity, in sharp contrast to the cocky little adults Hollywood so often casts as children. Also excellent is Maribel Verdú, whose performance as the housekeeper is a lynchpin of the film. Not surprisingly, the film looks stunning. It’s obvious that del Toro has thrown his heart and soul into this film, and any interview with the director will tell you how devoted he is to the telling of fairy tales—fairy tales, thankfully, in all their raw, original state, still dangerous, not the Disneyfied, G-rated versions. Four and a half chalk lines out of five.